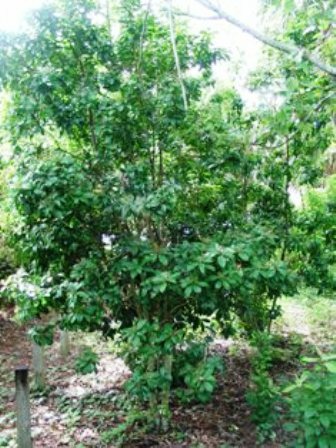 Native Americans in Florida called this tree, the black tobacco-seasoning tree, because they mixed its leaves with their tobacco to make it go further. 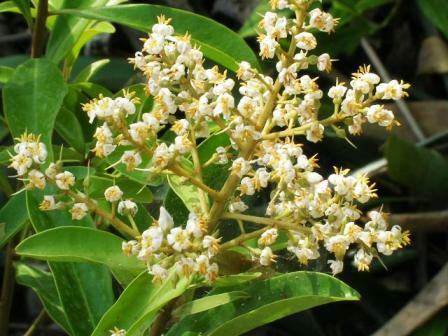 An evergreen large shrub or small tree, usually 3.5 m tall but can also grow upto 8 m; crown narrow, columnar with branches bending downwards during flowering and fruiting time; bark light gray to pinkish white bark, thin and splitting into papery, platelike scales. Leaves narrow, 8 to 16 cm long and 2.5 to 5 cm wide, simple, alternately arranged; varying in shape from oblong, ovate, oblanceolate, and elliptical;. leathery, glossy, yellow green, upper surfaces with paler surfaces underneath that have glands that appear as black dots; leaf base wedged, leaf tip acute to rounded; margin entire, thickened, and somewhat rolled backwards. Flowers small, white or pink with purple lines and dots; bell-shaped, 5-lobed; spicily fragrant; in showy terminal clusters. 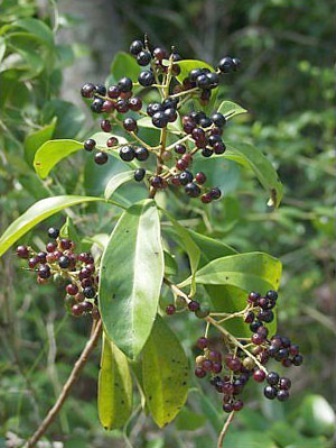 Fruits are round, glossy drupe that 6-7 mm wide; first appearing as red and then turning dark purple to black at maturity; skin thin enclosing a fleshy interior; It has a thin skin covering a dry, fleshy interior. The fruit hangs in dense clusters. Seed one per fruit, red brown. Fruit are edible raw but unappealing. Pulp is scant and acid. During olden days, the Mikasukis mixed marlberry leaves with tobacco to make the later go further. So they also called it black tobacco seasoning tree. Marlberry is frequently planted in gardens for landscaping purposes. Marlberry is planted in the gardens. It suits very well in mixed group and background plantings. It can be trained into a small tree by removing lower foliage and branches to expose the interesting trunk pattern. The multiple trunks become an interesting element in the landscape, and they look nice lighted at night. These should be planted at a distance of 5 m along an entrance road or sidewalk to create a nice linear planting of multi-trunked small trees. Since they will remain quite dense even in the partial shade, they also make a great screen for residential landscapes. 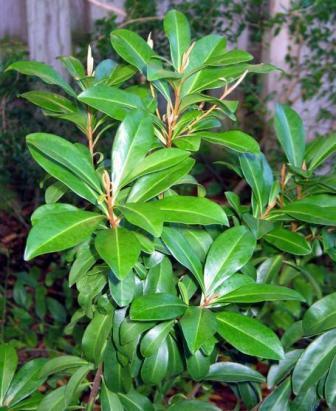 This shrub prefers well-drained soils and a semi-shade to full sun location in the landscape. It will grow in soils with a wide pH range from a sandy humus to calcareous shell and is fast growing. The plant is easily propagated from seed. Marlberry keeps blooming and fruiting almost all the year round under tropical conditions.